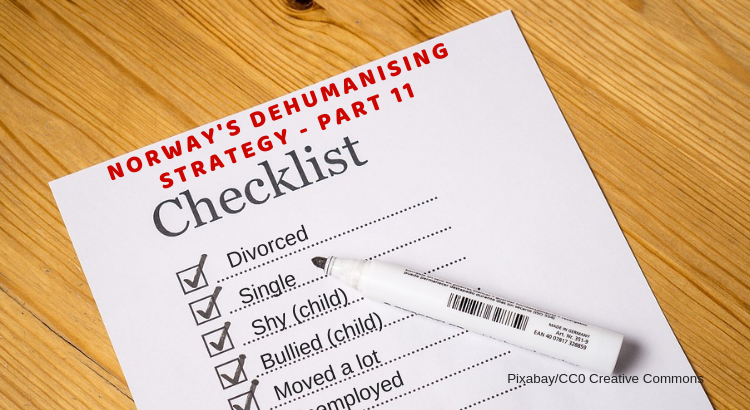 The majority of child welfare offices in Norway currently use a checklist to determine whether or not they should remove a child from its home. Fifty-eight per cent of the country’s local authority child welfare services use a checklist when they assess a message of concern, using the so-called Kvello model. This is a standard form that calculates the risk-factors and preventive/resilience factors. Researchers at NTNU Samfunnsforskning (NTNU Social Research) and RKBU Midt (RKBU Central Norway) interviewed child welfare workers and prosecutors from eight local authorities in Norway as part of an international project on objectivisation, measurement and standardisation in several sectors of society. Researchers are highly critical of this standardised checklist NCWS uses. For example, the likelihood of losing your child in a child welfare case increases if you are divorced, unemployed or on social security. The experts fear that the use of checklists objectivises children and families. From starting out as different people with different needs they become comparable things. The child is assessed based on a variety of risk factors, such as whether he or she has developmental delays, is shy or impulsive, possesses mental or severe somatic problems, has been bullied, has been adopted, or has lost siblings. The child’s family members are also assessed using similar risk factors. Based on the results of the checklist, caseworkers can fudge their way to creating a desired outcome that loosely fits the situation. If a case worker ticks six to eight risk factors, the usual outcome will be a care order. The child is then removed from the family and placed into an institution or foster home. Journalist Frida Holsten Gullestad wrote an article titled “Counting their way to the right conclusion”, which was originally published in Klassekampen in January 2018. She suggests that the use of these checklists enables caseworkers to distance themselves further and further from the ones they are paid to help. Such an automated setup, she claims, can drastically change the threshold of a care order. Some researchers suggest that this checklist approach does not meet the needs of the child or the parents, furthermore they say, it would be more beneficial to help solve the family’s social and economic issues rather than tearing the family apart.